We call this lavish ensemble "April in Paris". The hat features a molded crown, and sloped brim in black and red. 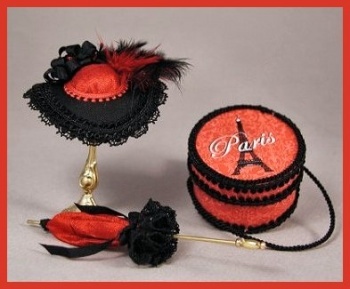 A matching parasol and hatbox are also included. Download is in PDF format. It contains complete instructions with dozens of photos, full size pattern pieces for the hat, parasol and hatbox, and full color artwork for the hatbox.